Posted by Gyaniz in News You Can Use. 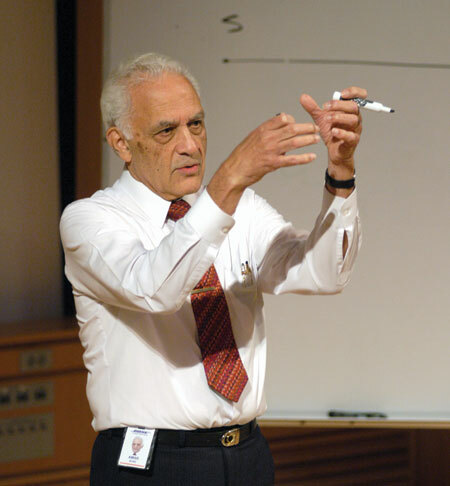 Dr. Amar Bose, founder of the Bose Corporation, has gifted his alma mater the majority shareholding in his corporation. The university will receive annual dividends to further education and research. Dr. Bose received his degrees at MIT and taught there until 2001. Dr. Bose received his bachelor’s, masters’ and doctorate degree from the university. His degrees were all in electrical engineering, he then served as a faculty member from 1956 up until 2001. Connect A to B and the Funda. A – Oliver Reed Smoot, Jr.
B – Harvard Bridge between Boston and Cambridge, Massachusetts. Connect – Smoot, a unit of length. Oliver Reed Smoot, Jr. was Chairman of the American National Standards Institute (ANSI) from 2001 to 2002 and President of the International Organization for Standardization ( ISO) from 2003 to 2004.As a pledge of MIT’s Lambda Chi Alpha fraternity in 1958, Smoot’s height was used to measure the length of the Harvard Bridge. As he lay on the Harvard Bridge (that carries Massachusetts Avenue across the Charles River), markers were made at each distance between his head and feet. The bridge was determined to be 364.4 smoots (plus or minus one ear) in length, and the markers remain to this day.